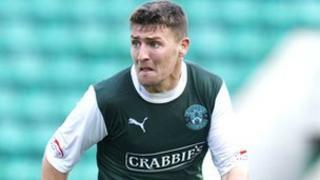 Hibernian midfielder Gary Deegan has suffered a broken jaw after being attacked in Edinburgh. Deegan was standing outside the Hardrock Cafe in George Street after leaving a nearby nightclub when a man approached and punched him in the face. An ambulance took the player to hospital, where he underwent surgery. Police have appealed for witnesses to the attack, which happened at about 03:00 on Sunday morning. Hibs had gone top of the SPL table just a few hours earlier, with Deegan playing in the 3-0 home victory over Dundee. The 25-year-old, from Dublin, joined the Easter Road club in the summer transfer window from Coventry City. His attacker is described as white, more than 6ft tall, between 20 and 25-years-old with a slim build and short fair hair which is spiked at the front. He was wearing a checked shirt, dark skinny jeans and dark shoes. It is believed he was with another male who was similar in age, but was shorter and wearing a t-shirt with light-coloured stripes, blue jeans and white trainers. Det Con Graham McIlwraith said: "We are currently still trying to determine the full circumstances surrounding this attack. "Given the time at which this incident took place, there were potentially a number of people leaving the various establishments in George Street who may have seen something suspicious. "Anyone who witnessed the assault or who can help identify the male responsible is asked to contact police immediately."